Shepherds Cottage has magnificent views of the Berwyn mountain range. It has two en suite king-size bedrooms and sleeps 4 people comfortably. It has a light and airy open plan living area complete with log burning stove. As with all our cottages it has its own private hot tub looking within its own walled garden. Shepherd's Cottage has 1 fixed master double with an option to turn the 2nd double into a twin. This was our 3rd time staying at the Rivercatcher and we absolutely loved it. Would recommend to anyone and everyone. See you again soon. 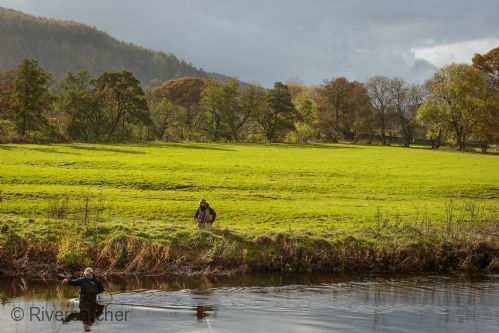 Set alongside the River Dee in stunning scenery, Rivercatcher provided an ideal getaway from the stresses of the routine workaday life. An added bonus was that we were also able to bring along our two rescue Pekes, which we had acquired after making our initial booking. The Shepards Cottage, with its enclosed garden meant it was ideal for them to run about outside, whilst waiting for my wife & I to finish a leisurely breakfast before setting out exploring the surrounding countryside. 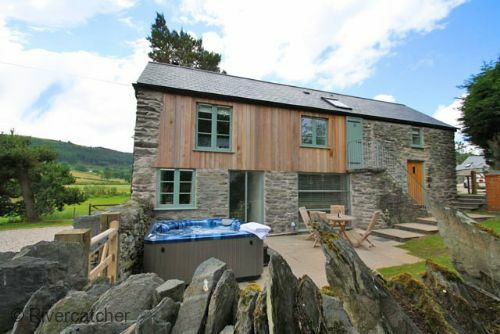 The location is neatly placed on the eastern edge of Snowdonia, allowing easy access to places like Dollgellau and Bala to the west, or Llangollen and Wrexham to the east. The welcome pack we received on arrival was generous and well thought out and contained local produce, which was nice to see. The standard of the accommodation was excellent in both quality and cleanliness, and all of the staff we spoke with were outstanding brand ambassadors - not that we needed any further convincing! All in all, we both enjoyed a relaxing week and fully intend to book again for next year. The reason for good as opposed to excellent for location is we felt it lacked a choice good quality restaurants nearby. Otherwise the scenery is fantastic and the cottage in an excellent position and we're sure we will return. The cottage had everything we needed and was lovely and quiet. We enjoyed the hot tub and the living room fires. You will need a car if you stay here as the sights and restaurants are all a drive away. The area is very restful. Sheppard’s Cottage could not have been more perfect in every way. 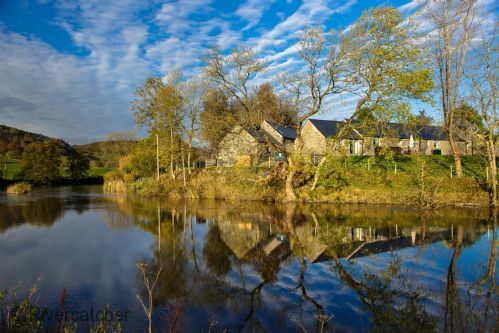 Beautiful accommodations and centrally located to our wedding venue and several day trips to Bala, hiking the Snowdonia mountains and visiting Conwy. We have been there several times, we like the quietness and the countryside, well maintained and spotlessly clean, which is very important to us as we have had lots of bad experiences in other cottages. We have also booked next year. We spent an almost faultless week at Rivercatcher. It was our second visit. The accommodation is clean and modern inside with very much appreciated adjuncts to self catering - good knives, washing up liquid, tea towels, silver foil, dish washer tabs, tea, coffee, milk, bread and even a bottle of wine! The hot tub was a hit with the kids - a lot of work must go into ensuring each week's guests plunge into a spotless tub. On the whole we thought it was lovely - the accommodation was comfortable and attractive, scenery beautiful, and it was nice and quiet. We have shown pictures on Facebook of it and recommended you to friends! There are just a few small things, preventing a "perfect" score and which may not even be noticed by other guests! There was no bin in my room, so every time I used a tissue I had to go into the en suite to dispose of it. It would have been nice if the room had had a comfortable chair in it. I couldn't enjoy the hot tub because, being a weak swimmer, I am nervous about being out of my depth, so I found it very daunting as the water was up to my neck and there no proper handles to hold on to. But as I said, we enjoyed our stay there and were fairly comfortable with most of it! The cottage is truly luxurious, beutifully situated in a quiet picturesque location and with wonderful walking routes from the doorstep. To come back to the cottage and sink into the hot tub after a day in the mountains was just perfect. To achieve hotel style and luxury in a self catering cottage is rare indeed. We will be back. We could find no fault with our stay. The cottage was perfect, everything there that we needed. Exceptionally clean and comfortable. The location and beauty of North Wales was breathtaking. A lot of thought has gone into making you welcome. A lovely complimentary hamper full of Welsh goodies as well as something for our springer spaniel. We would definitely go back. Rivercatcher was a wonderful experience from start to finish. We stayed in the cottage and one of the lodges and both were immaculate and well equipped. We thoroughly enjoyed both but the cottage wins - it is a special space and was perfect for my small family. The service provided by Jen - the owner - is worthy of specific mention too. Very responsive and helpful throughout. We will be revisiting, I’m sure. Very well presented cottage in excellent condition and thoughtful extras. Would recommend. 2 small comments: sleeps 4 was a bit tight mainly in sitting room. If coming again would book larger cottage. And stair gate provided for toddler did not fit stairs. A beautiful place to stay with amazing river and country views. The cottage had everything you needed and more. Delightfully furnished and spacious. I thoroughly enjoyed my short break at Rivercatcher. Shepherd’s Cottage is a lovely cottage. Every detail has been thought of. I took the family Labrador and he enjoyed his stay too, and his welcome pack! The whole location is beautiful with easy access to many lovely walks, towns / villages and attractions. I enjoyed the peace and quite that I wanted during my stay. We will be back and I’ll recommend to others. We had a great weekend away in Denbighshire staying in Shepherds cottage during the first weekend of Jan 18. It was a lovely cosy cottage perfect for the three of us. I especially enjoyed the log burning heater - plenty of logs are provided. Luxurious rooms with the most comfortable beds and linen. Great local products provided in the basket of essentials and definitely recommend the additional breakfast pack which had the most delicious bacon, sausages and black pudding, again local produce. It was our first time into north Wales and we used rivercatcher cottages as a base to explore. We were highly impressed with our visit and look forward to seeing more of North Wales as there is a lot to do. 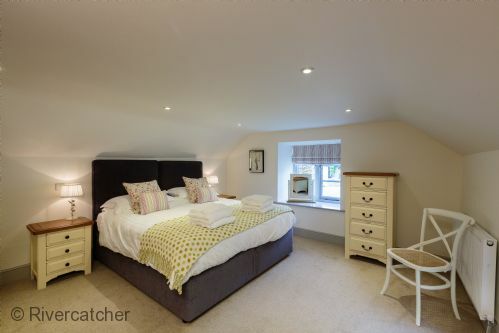 We had a very comfortable - I would highly recommend rivercatcher cottages and would not hesitate to book again. Very comfortable warm cottage, all basics thoughtfully provided, dog loved the underfloor heating! Sitting room a bit small, but bedrooms a good size, lovely walks from Llandrillo, amazing food at Tyddyn Llan next door. Can thoroughly recommend this place. We found Shepherd's Cottage to be the perfect place to stay for our walking holiday in Wales. Shepherd's Cottage was very well located for our walking holiday in Wales. We found the cottage to be very comfortable for the three of us and our labrador, and was well presented, well equipped, and easy to keep clean. The extra touches such as the welcome pack of local produce, the lovely private hot-tub, and the good TV with Netflix added the finishing touches to make our stay very enjoyable. My family and I had a wonderful 2-night stay in the Shepherd's lodge. The accommodation was clean, cozy, and ready for us even when we arrived a few hours earlier than the check-in time. The welcome hamper we found waiting for us was a thoughtful touch. We also met the owners of the place and found them to be warm and helpful. The breakfast hamper we ordered was amazing -- fresh eggs, meat, and vegetables, and delicious bottles of milk and juice. We are very much looking forward to staying in Rivercatcher again. Stayed for a week at the end of September - lovely welcome hamper and the breakfast hamper was a really nice surprise. Nice to have items for our four legged friend, particularly the dog blanket. The cottage was lovely and clean and most things that you would need in the kitchen (although could have had a few more pots for the oven). The hot tub was a nice touch and we used every day - was very nice after we had walked up Snowdon!! All in all a lovely stay and we would hope to return. We really enjoyed our week at Rivercatcher, the place is very peaceful and overall the facilities were good. 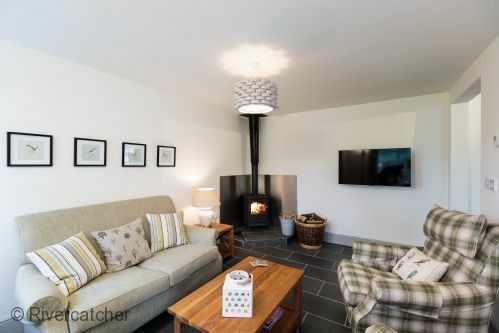 Personally, I wouldn't book Shepherds Cottage again though for 4 adults (and two dogs) as it was too small, I would book one of the bigger cottages. (Double bed for two adults and the en-suite shower were both too small for us) The lounge was not big enough for everyone to stretch out and the sofa was uncomfortable. It's a shame that the big window in the kitchen was not built as french doors, leading out to the patio, as you felt a bit hemmed in. All the windows in the place are low down and you can't really appreciate the views from the property, although i appreciate most cottage windows are like this. 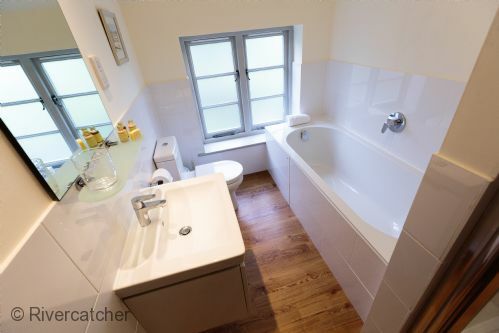 I didn't realise how much I would miss a downstairs toilet, having to keep running up the stairs was getting on my nerves by the end of the week. Dogs not allowed upstairs was frustrating to learn on arrival and there were not enough walks from the property for us, we spent the week getting in the car and driving out to places. Lastly, and this may have just been us, but access to the river is limited and we couldn't find a way down to the edge. I think only one of the cottages has access. However, the underfloor heating, the log burner and hot tub were fantastic and exactly what we like when coming back from a long walk. Overall the place is lovely and I would return to a larger property. Super location and a comfortable well equipped cottage. Unfortunately the weather was not conducive to using the spa but it did not spoil anything for us. Thank you for leaving a review. Glad you had a lovely stay. Thank you also for taking such lovely photos around Rivercatcher and to your wife for her beautiful painting. We have been for the second time at river catcher and really enjoyed our stay. Everything is perfect and it is really a good place to make holiday from home. Andy and Jane are very nice and always helpful. We had a lovely week here and it proved to be a very comfortable base to explore North Wales. Everything we needed and more besides! Hot tub and Netflix, high quality fixtures and fittings, helpful tips on the area.... all much welcomed. Thank you! A very lovely cottage in a beautiful setting. Owners were friendly and welcoming. Great place to stay with four legged friends as the gardens are enclosed and quite private. Wonderful private hot tub and thoughtful welcome basket as well as some basic items provided e.g. cling film, dishwasher tablets. 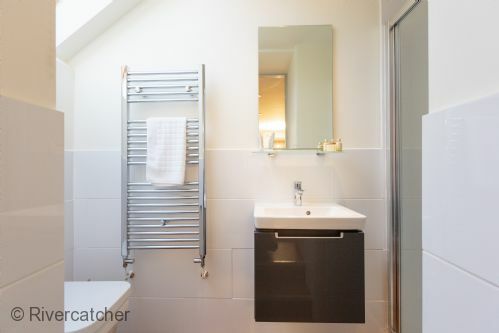 Modern and clean bathrooms (with bathrobes), comfy beds, well designed and equipped kitchen. 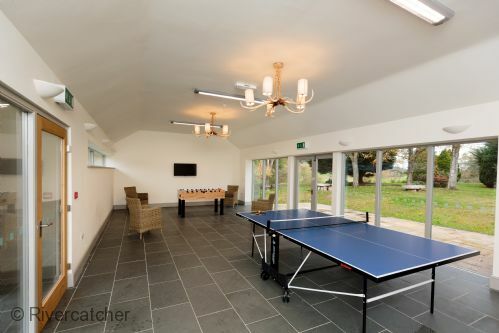 Walks by the river, on-site fishing and games room. Couple of extremely good restaurants close by and a farm shop that provides high quality products just right for the barbecue or other self catering. Overall our stay at Rivercatcher was faultless and a perfect place to relax. Would not hesitate to recommend to others or return to this idyllic spot. It was our first visit to Rivercatcher, and North Wales. The customer service was excellent, all queries were dealt with promptly and efficiently. The cottage was very clean and comfortable , and it was reassuring to see Aled everyday, in case there were any problems, - not that there were any. Our only minor concerns were the lack of bowls for the preparation of food, only one baking tray suitable for use in the oven, and no toast rack; but these really were minor points. We particularly liked the flexibility regarding booking. So many holiday cottages can only be rented for whole weeks, we were able to add an extra day which was most beneficial. The location in the Dee Valley meant that we were able to visit many varied areas in the region, not just the tourist hotspots around Snowdonia. These are superb 5 star cottages in a wonderful location. We will certainly return to Shepherd's Cottage in the near future. Our second stay in Shepherds Cottage, arrived drained and as previously did not want to leave. Relaxation, stunning views and attentive staff. Now just trying to recapture some of the feeling at home. Just book it ! We wish we could do it all again! 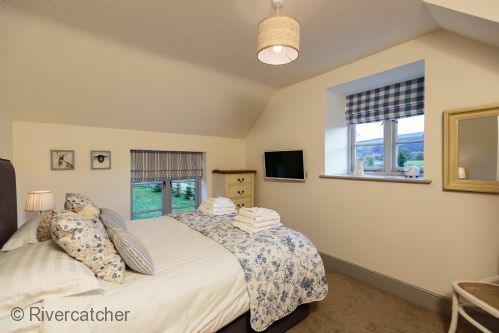 We stayed in Rivercatcher for a long weekend to try and beat the January blues - and boy did it do just that! The process of booking was super easy, and we had plenty of pre-arrival emails with full instructions on how to get there, how to get in and things we could do once we arrived. The cottage itself is beautiful inside and finished to a really high standard. Plenty of glassware and kitchen utensils which was great as you often just find 4 of most items in accommodation with 2 bedrooms. The hot tub was also really well looked after, with Aled visiting daily to top up the water. There is also a wood store outside which houses unlimited woods - what a great extra bonus. 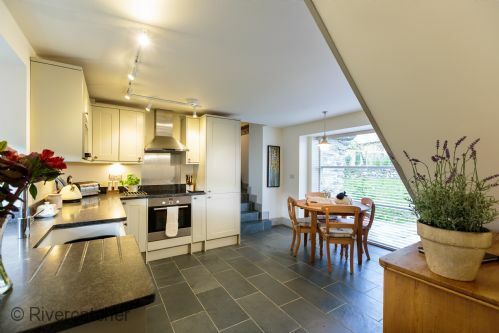 The cottage is situation down a long lane/road which means if you're after dark nights with a night sky full of stars, this is definitely the one for you. The only tiny thing we would comment on was the towels - it was a shame there weren't separate ones for the hot tub (although there are dressing gowns) and the main bathroom towels could do with being larger. We can't wait to come back again! I have stayed in many cottages and this cottage surpassed expectations.it is immaculate! Very comfortable, great log burner with unlimited supply of logs, lovely welcome basket and local and great hot tub to soothe achey legs after mountain walk! We had a great stay at rivercatcher in August 2016, everything was just perfect we will definitively come back !! !